POND PINE (Pinus serotina) – Pond pine also called marsh pine, bay pine and pocosin pine, and is a medium-sized tree that grows on soils with a high water table. The species name, serotina, means “late” and refers to the delayed opening of the cones, up to two years. This species grows from New Jersey southward through the coastal plains of Delaware, Maryland, Virginia, North Carolina, South Carolina and Georgia to central Florida. Within its native range it is most frequently found on wet or poorly drained sites. This species makes excellent growth on mineral soils or on land that is not continuously waterlogged. Like other pine species with serotinous cones, pond pine cones open and release seed soon after exposure to heat from fire. Pond pine is utilized for lumber and pulpwood. This tree grows on wet sites where other commercial species will not grow. The pocosin and pond pine stands are considered a major wildlife sanctuary. 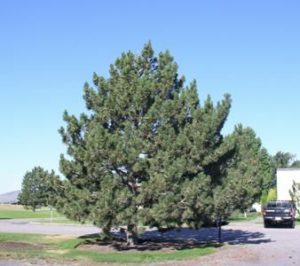 This evergreen tree is medium size; trunk diameter of usually 2 feet or less and a height of 40-70 feet; an open, rounded or irregular crown of stout, often crooked branches. Preferred habitat is swamps, shallow bays, and ponds; often in pure stands. Distribution is throughout the Escambia region. Pine needles are 5-8 inches long; 3 to a bundle; slender, stiff, yellow-green and twisted. The bark is black-gray or reddish-brown, furrowed into scaly plates that may appear triangular or rectangular in shape. The cone (fruit) is 2-4 inches long, and nearly round or egg-shaped when open; shiny yellowish-green; nearly stalkless on the branch; light brown at maturity; remaining closed for many years on the tree. The cone scales are slightly raised and keeled, with prickles that usually shed before the cone falls to the ground. While the Pond Pine is scattered throughout the forest little or no distinction is made from other pines in the vicinity, thus it is frequently cut and marketed with the other pines. Its chief utilization is as pulpwood. Some authorities consider the tree to be a variety of the upland Pitch Pine but their differences are quite marked and their distribution is distant.